Chop garlic, sweet potatoes and onions and add to large pan along with olive oil. Add curry powder and mix well. Sauté over a medium heat, stirring occasional, for approximately 30 minutes or until potatoes are soft. Add water to steam potatoes now and then. When potatoes are cooked, remove from heat and salt and pepper to taste. While the potato mix is cooking, prepare salad. Rip up lettuce, chop parsley and dress when potatoes are almost ready. 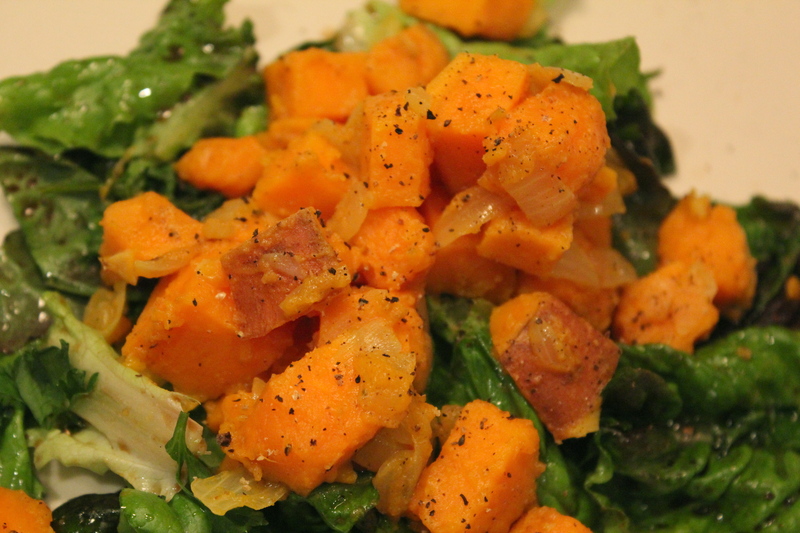 Plate salad and spoon sweet potatoes on top.